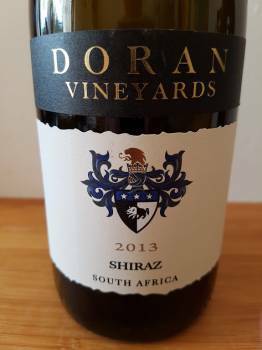 Doran Vineyards, the Voor Paardeberg owned by Irishman Edwin Doran with André Badenhorst, father of Adi, consulting is tracking in the right direction – a Barrel Fermented Chenin Blanc 2013 and a Shiraz 2013 were both a significant step up on anything produced in the maiden 2012 vintage and the farm has to be commended on the good quality relative to price it’s starting to offer, both wines below R100 a bottle. Spontaneous fermentation and maturation for 10 months in older 300-litre barrels. Apple, peach and apricot, a hint of spice and some yeasty complexity. Rich with tangy acidity and slight bitter quality lending interest. Rock solid. 20% whole-bunch fermentation, maturation lasting 12 months in 500-litre barrels, 10% new. A pretty nose showing top notes of lily and fynbos before red and black fruit plus some spice. Lots of pure fruit with fresh acidity and nicely grippy tannins. Great everyday drinking. Find our South African wine ratings database here.